What is it about an environment that makes you feel bored? What makes you feel like time is moving slowly, or that you have been waiting a long time? It probably wouldn’t surprise you to hear that many people cite repetitive (or looping) television programs to be a major factor. Have you ever been at a medical office and seen the same “medical facts” flash on the screen a number of times before seeing your doctor? How about the gas station where the screen plays the same advertisement or weather forecast multiple times in 3 minutes? Have you ever been at a restaurant and seen the same news stories played every 15 minutes? If you answered “yes” to any of these questions, you are not alone! Businesses often turn to television content providers with limited libraries of content to show “relevant” content to their customers. Unfortunately, most of these providers don’t take into consideration the amount of time customers wait, or the average frequency of visits the same customer makes in any given week or month. When people are bored they feel like their time is being wasted. Business owners don’t want to waste customers’ time. Happy customers make greater purchases and come back again in the future. 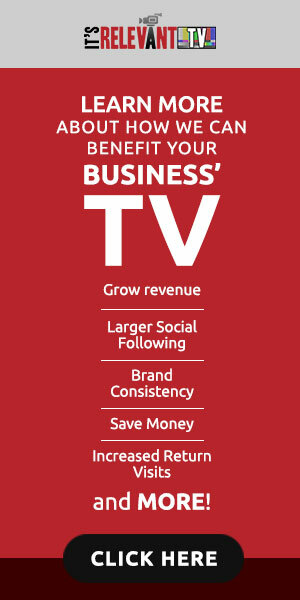 The It’s Relevant TV custom TV platform takes all of this into consideration. 1. There is no loop. The programs shown on the custom TV networks do not repeat over and over again in the same sequence. 2. The content library is gigantic. It’s Relevant TV licenses television programs from top TV producers and short-film makers around the world. As a result, the company constantly changes the content they deliver to each of the partner televisions. 3. It’s Relevant TV constantly updates the content. Some other services “refresh” the content on custom networks once or twice a month. It’s Relevant TV releases new content to partners almost hourly, expanding the library and creating new experiences all the time. 4. It’s Relevant TV makes custom TV easy to control. Some other solutions require that the business owners have to go in and select specific videos that they want played, and then have to go back and change their selections anytime they want the programming on their TV to change. It’s Relevant TV changes the programming for you, while keeping within your preferences and parameters. Instead of picking specific videos, you simply choose from a list of 50 categories of content. The service then continues to deliver videos in only the categories you select. It can take a long time to create a waiting room environment that you are 100% happy with for your visitors. You want people to feel comfortable, to be entertained, and also to be informed about all you have to offer. Buying thousands of dollars of furniture, changing the lighting, updating music and even creating the scents are some of the ways businesses and professionals are altering their environments. But what if there were an easier way to transform your space? And what if major changes could be made inexpensively from a smartphone app? It sounds like a fantasy, but it is now a reality. Televisions are the focal point of most waiting areas, but until now there was no way strategically integrate one in your environment. Introducing: It’s Relevant TV for iOS. Businesses and their employees can now personalize and control the content displayed on their televisions directly from their iPhones. The new application paired with a $99/month subscription allow professionals to take control. Ideal for hospitality businesses including medical offices, hotels, restaurants, and sports arenas, It’s Relevant TV helps businesses easily take control of the programming displayed on their televisions, while influencing visitor satisfaction, purchasing decisions and social media followership. The company, Software Advice, asked more than 5-thousand people to rate how they felt about wait times. 64% said the wait would be more bearable with a TV in the waiting room. Participants in the study chose television over free food and beverages and even access to WiFi. “ TV that shows interesting content alongside a business’ messaging makes both the customers and the business happier,” according to Krackehl. It’s Relevant TV provides simple controls for all aspects of their screen displays. It is simple for you to chose the video content that is relevant to your customers. The company’s experienced editors compile diverse, timely and interesting content and organize it into 40+ categories, ranging from general health, travel, business, kids shows, fashion, sports, comedy, cooking and non- controversial news. Business owners, administrators and facility managers using the service for display, simply choose the categories that match their vistors’ interests most. Becker’s Hospital Review reports the average wait time nationwide is now more than 15 minutes. Most TV shows last much longer and start at the top and bottom of the hour. IRTV segments are current, timely, engaging and never run more 4 minutes in length. All of the videos are subtitled so even if you prefer a quieter setting people can still enjoy the programming. It’s Relevant TV for iOS is free for It’s Relevant TV customers. The application includes a demonstration video, accessible upon download. Click Here to access the application on the iTunes Store.